Boost Your Budget Pantry Challenge - Week 1 | A Savings WOW! 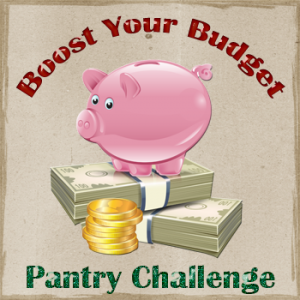 We’re excited to have you join us in the Boost Your Budget Pantry Challenge series that we are participating in and posting about throughout the month of January! The Challenge is being co-hosted by us, Shopper Strategy, Going Crazy Wanna Go?, The Frugalista Chick, Matter of Cents, Coupon Pals, Thrifty Divas, Frugal Mom of Two, How About Free, TheItMom.com, All The World Is Art, Sweeping The USA, Mommies Point of View, Mama’s Money Tree, Crunchy Frugalista, Fab Find Foodie, Making Time For Mommy, Adventures in Coupons, Full Price? NEVER!, The Frugal Navy Wife, and Generations of Savings. What is the Boost Your Budget Pantry Challenge? This January we, along with our other co-hosts, will challenge ourselves by eating from our pantries and stockpiles. This is not a “no spend” month, this is a “make do with what you have on hand and spend as little as possible” month. Since everybody’s goals are different and will depend on their own household needs, we can each set our own rules. The point is to start off the new year by boosting our budgets using what we already have! Our goal this week is to go through our pantry and stockpile to determine what we have and what types of things we still need in order to prepare the meals for our family this month. We also plan on finding more recipes that will appeal to our household of six so we won’t have to eat out as much. Overall, we hope to “boost our budget” by spending no more than $200 this month on grocery and expenses from eating out in January. We’re also co-hosting a #CookingandCoupons Twitter Party next Tuesday with Momma Cuisine where we’ll be talking about using coupons to save money on the groceries you purchase to make great everyday meals for your family! Make sure to RSVP for your chance to win prizes during our Twitter Party! We’re also giving away a $25 Coupon Clutch gift certificate each week to one participant who either leaves a link to a challenge post or a comment about their challenge goals. Will you join us? Find more coupons towards your grocery shopping in our Coupon Database.